While looking at images for the revision of one of our books, I came across an image of a metal pitcher from the 1930s. It had such clean, modern lines that it could easily be mistaken for a contemporary work. It got me to thinking about how there is extraordinary beauty in everyday objects used around the house. Indeed, many of these objects from the past end up in museums’ design collections as examples of beauty and utility. That goes especially for ceramic objects. Tableware ceramic objects can be found in the collections of most museums. Although this object is not exactly tableware, it is an example of a period style in American art that is one of my favorite stylistically: Art Moderne. Art Moderne was the stylistic descendant from Art Deco, with which it is sometimes confused. Whereas Art Deco was all about surface ornament and fine craftsmanship of decoration, Art Moderne was more concerned with clean lines, curving and shiny surfaces, and an absence of ornament. It was inspired by modern American industrial society, airplanes, and automobiles. The style was perceived as a common person’s alternative to the more elaborate Art Deco. Art Moderne is characterized mostly in architecture and decorative arts. The Hall China company introduced single-kiln firing of its wares as opposed to firing the body and the glaze separately. The process fused together the body and glaze at a temperature of 2400 degrees Fahrenheit, allowing the glaze to penetrate the body. The process created the first lead-free pottery glaze in the world, as lead compounds would not work in such high firing temperatures. Hall designed no fewer than 47 new colors for the single-fire process, producing bright colors never seen in American pottery before. 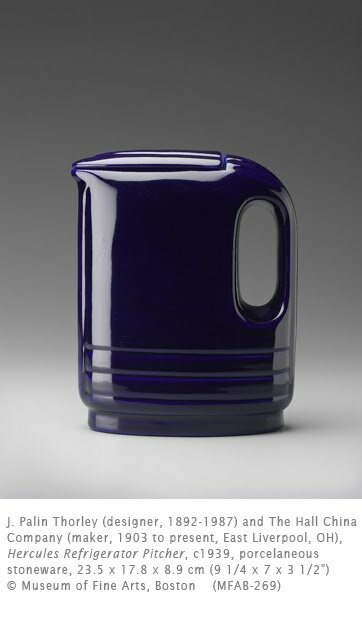 In the 1930s, with the rise in use of refrigerators, Hall developed a line of refrigerator-wares, to which this pitcher belongs: pitchers, butter dishes, cheese dishes and leftover savers. The streamlined shape, horizontal banding, and rounded edges of this pitcher all mark it as firmly in the Art Moderne style. J. Palin Thorley was a third-generation ceramic artist in England. He was trained at such prestigious ceramic factories as Wedgwood. He brought his talents to American industrial potters. In Williamsburg, Virginia, he created replicas of colonial ceramics from the Craft House Museum. In contrast, he also created avant-garde wares such as this pitcher in the Art Moderne style.